Every day, thousands of people use the I-710 freeway to get to work or school. At the same time, trucks loaded with cargo from the Ports of Long Beach and Los Angeles head north on I-710 with merchandise and materials going to stores and factories across the country. These conditions result in the I-710 freeway experiencing serious congestion and safety issues which will continue into the future. As a result of population growth, increases in the number of cargo containers arriving at the Ports, increasing traffic volumes, and aging infrastructure, local residents, governments and community groups have been working together to find ways to make the I-710 safer and easier to drive, improve air quality and public health, and improve the freeway's design and traffic flow. 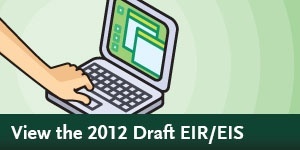 Previously, a Draft EIR/EIS was released for public comment in 2012. Based on the comments received and relevant new information, a new set of alternatives was developed and analyzed in the Recirculated Draft Environmental Impact Report/Supplemental Draft Environmental Impact Statement (RDEIR/SDEIS) that was released on July 21, 2017. The alternatives studied in the RDEIR/SDEIS include Alternative 1 (No Build), Alternative 5C (Modernization of I-710 Freeway), and Alternative 7 (Modernization and Addition of a Clean-Emission Freight Corridor). All build alternatives proposed also include programmatic elements, including a zero emission/near zero emission truck deployment program, expanded transit services, and a community health benefit program. The public comment period for the RDEIR/SDEIS was ultimately extended to Monday, October 23, 2017. All official comments received have been reviewed and will be responded to as part of the Final EIR/EIS. At the Metro Board Meeting held on March 1, 2018, the Metro Board of Directors selected Alternative 5C as the Locally Preferred Alternative (LPA) for the I-710 Corridor Project. This Board action recognized the need for immediate investment in the corridor through an Early Action Program by prioritizing implementation of local interchange and arterial road upgrades, new pedestrian and bike crossings, and support in identifying funds for the purchase of near-zero and zero emission trucks that operate in the I-710 corridor until funds for larger corridor improvements become available. All recommendations for mainline freeway widening projects in the future will be presented to the Metro Board for review and approval. Based on the Board’s direction, the I-710 Project Team will be working on three major parallel efforts: the Final EIR/EIS, the Early Action Program, and Additional Parallel Activities. Please visit this website on a regular basis to stay informed of the latest updates. Stakeholder feedback on the Community Health Benefit Program will be gathered through a separate committee to be established by the Gateway COG, in partnership with the agency (to be determined) implementing that program. Local Advisory Committees led by individual cities along the project corridor will continue to meet, at their discretion, to receive updates from their city’s TAC representative on the status of the environmental process and the Early Action Program, as well as provide opportunities to gather feedback from community members. These committees can also serve as a key link between their respective City Councils, the TAC and the new committee to be established by the Gateway COG. 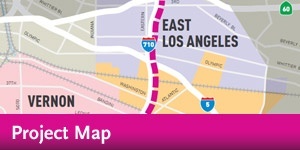 Metro is joined by several partner agencies in completing the I-710 Corridor Project EIR/EIS. These agency partners include the California Department of Transportation , the Gateway Cities Council of Governments , the I-5 Consortium Cities Joint Powers Authority, the Port of Long Beach , the Port of Los Angeles , and the Southern California Association of Governments . Public involvement is critical to the success of the I-710 Corridor Project EIR/EIS. You are encouraged to attend meetings and events to provide your feedback and suggestions on the topics being discussed. TAC meetings are generally held on the third Wednesday of the month beginning at 1:30 p.m. and take place at the Gateway Cities Council of Governments (Gateway COG) office located in Paramount, CA. Please visit the Gateway COG’s website for additional information on these meetings.